We are excited to introduce Shayne as our featured April #battgirl. Enjoy her story about how she began quilting and her clever tricks of the trade working with voile and how she uses up her scrap batting. Quilters Dream: What inspired you to start quilting? Shayne Dickson: I began quilting about 8 years ago. My husband was about to begin medical school and we were living with his parents to save some money before he started. I had always admired my mother-in-law's artistic and creative abilities, especially her quilting. I came from a home where my Girl Scout patches were stapled onto my sash (sorry Mom, I love you!! ), and the thought of sewing never really crossed my mind. As soon as I expressed an interest, my mother-in-law sent me straight out the door to a fabric store to pick out fabrics for my first project. I still remember walking the aisles in awe of all of my choices. How does one choose!!!?? As soon as I sat down at the machine I was hooked. For my birthday, my husband pooled in some money from moms and grandmas and bought me my Bernina 1008 that I still love and use. My mother-in-law calls me her "Little Grasshopper" and I call her "Master" because she taught me so much about quilting and sewing. She still puts up with all my calls and crazy sewing questions at all hours of the day! Four years ago when we moved to Ohio for my husband's Radiology Residency was when my little quilting business began its journey. QDB: How do you get inspired when quilting these days? store and all of the possibilities it opened up for me. 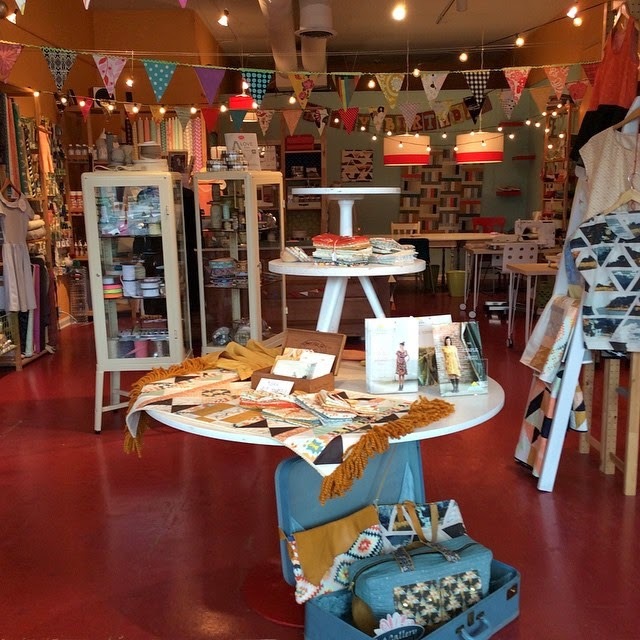 It just so happens that is was the store of the amazing April Rhodes of Art Gallery Fabrics and her lovely mom, Annita. They have answered so many questions and encouraged me and my quilting every step of the way! Their little shop is still my favorite place to go and be inspired and uplifted not only by the fabrics, but by all of those whom I have met and talked to! I'm inspired by everything and everyone around me. I've had four kids since I began my quilting journey and love designing and quilting for them. I love creating something with a specific person and their tastes in mind. Nothing is more inspiring to me than individuals and their individuality. My favorite things to quilt are baby quilts and pillows, mostly because I know they will loved and used. I also enjoy making bags of all shapes and sizes and sometimes if you twist my arm enough, clothing. I'm hoping to put together a quilt pattern collection somewhere in the near future! QDB: What is your favorite part about quilting and its industry? SD: My favorite thing about quilting and the quilting industry is that there are never ending possibilities! Just when I think I have seen everything, BAM, someone creates something new and amazing. I love seeing new quilts that make me scratch my head and leave me wondering, "How in the world did they do that!?". I love the quilting community, online and in person. I once hunted down a woman in Target because I saw that she had a quilter bumper sticker on the back of her car, she didn't even call the police! Instead, we shared pictures of our quilts and chatted about our favorite places to shop for fabric. Instagram (my favorite form of social media) is like one giant quilt guild. Quilters share their work, create challenges and quilt-alongs, offer encouragement and give great advice! QDB: What advice would you give someone who’s never tried Quilters Dream Batting? DreamCotton. It love it's versatility. I can use it whether I am densely quilting a project or trying to stretch my quilting as far apart as possible or even a combination of both. Either way I know I can rely on it to quilt beautifully, hold up in the wash, remain soft and continue to better with age. 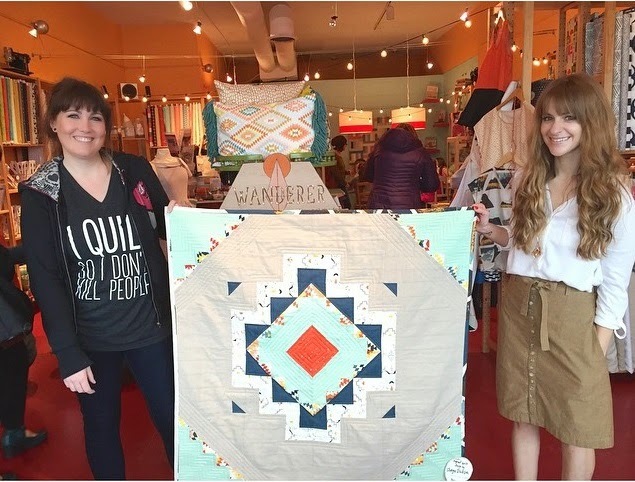 The Wanderer Quilt was pieced together with some fabric given to me by Art Gallery Designer, April Rhodes to show off her latest line, Wanderer. (Check it out for a free pattern) She gave me a beautiful cut of soft voile to use for the backing. I was very nervous to quilt the voile because it tends to be very slippery. My vision was to have some very densely quilted areas as well as some big open spaces. I needed a batting that could handle both. I decided to use the Dream Cotton and it was a perfect choice. To keep the voile from slipping while quilting I used a combination of spray basting and pin basting. It really helped to heat set the layers after I spray basted, and then add the pins to really keep it secured. The Dream Cotton pressed well and remained perfectly basted. I was able to quilt the voile with very few issues. This quilt was all about the baby! I really wanted a batting that I would be able to quilt heavily for durability but still remain soft and cuddly. And especially something that would hold up in the wash! The Dream Cotton hit the mark again! This quilt also used a combination of pin and spray basting. I used my walking foot and guide to create the straight line quilting. I always save every scrap of batting after finishing a bigger quilt project. I use my scrap batting for smaller projects like this French Bulldog pillow I made for a friend. The pillow finished at about 8" by 8". In my opinion, no piece of batting is too small to save! Pillows make great gifts and when inspiration hits, I'm always glad to have my scrap batting. Whenever I make pillow covers I baste my front to the batting and back with a piece of muslin. This prevents lint build up in my machine. This quilt was made to put in a local quilt show and then gifted to someone to use as a lap quilt. I used all Kona Solids and most of them were dark. I was worried that with the light batting some of the batting lint would come up and show. One quick run with my lint roller and it wasn't a problem! If I'm not washing my quilts before showing or giving I always go over them with a lint roller to pick up excess lint and thread. **Another tip to prevent bearding and pokies, break the static charge which causes the batting to pop through especially when working with darker fabrics. Click HERE to read more. The Plus Quilt was meant to be a "cuddle up and read quilt" for my daughter for Christmas. I wanted it warm and comfy. I spread out the quilting so it would have a nice drape. The Dream Cotton batting package said that quilting could be up to 8 inches apart and I took advantage of that. The result was a wonderfully soft quilt great for curling up on the couch with a good book! This quilt is one of the most used in my house and has held up nicely in the wash and gets even better with age. Don't forget we are always looking for our next Featured #battgirls. Click HERE for more info on how it could be you!